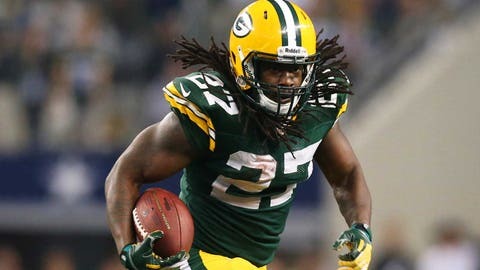 The closest Packers player to make it was rookie running back Eddie Lacy, who was named as a first alternate. GREEN BAY, Wis. — For the first time since 2005, zero members of the Green Bay Packers were named to the Pro Bowl. The 2005 Packers were 4-12 and nowhere close to making the playoffs under then-coach Mike Sherman. This year’s Packers can still win the NFC North and host a first-round playoff game with their group of non-Pro Bowl-worthy players. Green Bay was one of five teams to not have a single player named to the Pro Bowl, joining the New York Jets (7-8), New York Giants (6-9), Atlanta Falcons (4-11) and Jacksonville Jaguars (4-11). The closest Packers player to make it was rookie running back Eddie Lacy, who was named as a first alternate. Green Bay also had seven other alternates: quarterback Aaron Rodgers, outside linebacker Clay Matthews, wide receiver Jordy Nelson, left guard Josh Sitton, fullback John Kuhn and cornerbacks Sam Shields and Tramon Williams. It’s possible that one or more of those alternates could still be a part of this year’s Pro Bowl if others at their position drop out of the game.